Otero Junior College is pleased to announce that on Dec. 9 2018 eight new members were inducted into OJC’s chapter of Phi Theta Kappa (PTK). OJC’s PTK organization has been working on two projects, nominated three sophomore students for the All-Colorado Team and participated in OJC’s Club Fest. 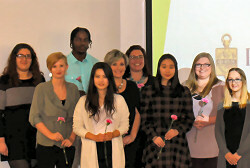 During the fall semester, PTK honor society at OJC has continued two projects; the College Project and Honors Project. The College Project involved preparing spotlights for OJC’s Rattler Rumor, to provide recognition to OJC students, faculty and staff. The Honors Project assisted Bent’s Old Fort National Historic Site to inform area 4th grade teachers about the Bent’s Old Fort’s “traveling trunk.” The trunk houses historic artifacts and games relating to the Santa Fe Trail. Teachers may borrow the trunk to assist them in teaching the 4th grade Colorado history unit. PTK nominated three sophomore students for the All-Colorado and All-USA Academic Teams. These students will be honored by the Colorado State Legislature at a luncheon this spring, and by OJC at Commencement on May 4. The chapter also participated in OJC’s Club Fest, an opportunity for students at OJC to learn about the different clubs and organizations available to them. They continue to offer bricks engraved with graduates’ names to be added to the Foundation Wall between MacDonald Hall and the Humanities Center. For more information contact Kaysie Schmidt at 719-384-6854 or Kaysie.Schmidt@ojc.edu. Otero Junior College is pleased to announce that on Dec. 9 2018 eight new members were inducted into OJC’s chapter of Phi Theta Kappa (PTK). Back row: (l-r) Angelina Apodaca, Rocky Ford; Miguel Lopez, St. Croix, US Virgin Islands; Katy Jones, La Junta; Jules Berg, La Junta; Jade Witzel, Stratton Colo. Middle row: Harli Montejano, La Junta, Caroline Finkner, La Junta; Ruka Shimohata, Japan. Front row: Sena Park, South Korea.